December Stats - 13029 Pageviews from 5594 unique visitors. Our most visited index pages, in order of popularity were: ACCOMMODATION - ENQUIRY - BUSINESSES - INFORMATION - ATTRACTIONS - REAL ESTATE - CLASSIFIEDS - HEALTH/RETIREMENT - TIRAU. We all know about Gen X and Gen Y. The different trends identified in each generation have allowed marketers and businesses to adopt strategies accordingly. Now, the next generation of consumers is beginning to have an impact. This is Generation Z; children born from the mid 1990's. Yes, that means that the top level of Gen Z is still only 15, but today's 15 year old is very different to previous generations and is an indicator of how businesses should be planning ahead. Parents always joke that their child knows more about the computer than they do. More often than not, the child in the family was using MySpace years before Mum and Dad realised how convenient it can be for communicating with family and friends. They programme the video or DVD recorder. They understand the intricate system of remotes to put on a DVD. They can build websites while many parents are still struggling to understand Google. But what happens when these switched on teenagers become the working, spending consumers of tomorrow? Will business keep up where parents haven’t? 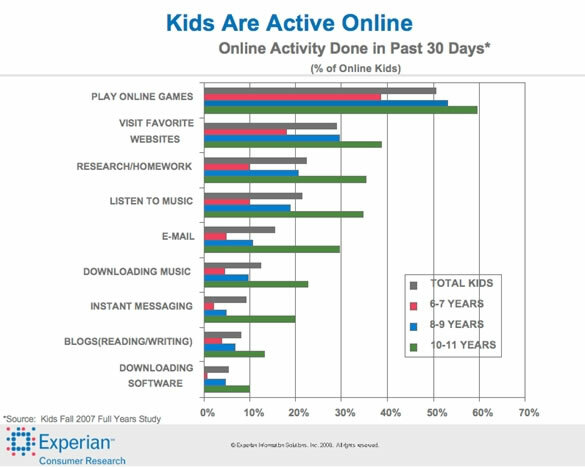 Marketing Charts reports on a study carried out a couple of years ago by Experian Consumer Research into the daily habits of 6-11 year old children. Although a US based study, the trend is so strong that it would be ridiculous to suggest a similar result wouldn’t occur here in New Zealand. The research shows that 89% of this group is active online; and have developed very different communication styles and preferences to their parents. Due to the huge influence digital technology has had in their short lives, these children have experienced radically different childhood experiences to adults. The continual flood of on-demand information and entertainment provided by modern technology has also developed some other noteworthy trends. As reported by Marketing Vox, Generation Z will be the most multi-tasking generation to have ever existed, perfectly comfortable with multiple information streams and activities running concurrently. Having a number of browser windows open at once, the TV on in the background while sending messages to friends is extremely common. These are the consumers of tomorrow. In less than five years, Generation Z will be working, earning and consuming. That means businesses have a four to five year window to prepare to deliver product and content in the methods preferred by this highly important group. There will be an increase of online shopping and downloading. Quick solution marketing that provides instant answers and fast purchasing will increase. This generation will be less tolerant of businesses that prefer to maintain traditional forms of communication and marketing. No email enquiries asking for a quote from these guys – they want to click and choose online, pay immediately and receive an instant response so they can move onto something else. This active group will be less interested in hybrid marketing – where an online presence merely enhances an offline business. Your business better be fully capable of servicing a customer without forcing them to the phone or suggesting they drop into your high street store. By then, they’ve already clicked back and bought from your competitor. Social media is increasingly going to play a part in business / consumer relationships. Generation Z is far more interactive than any previous generation. Not for them the passive marketing of television or magazines. TV commercials can be skipped with a DVD recorder and you can’t click on a magazine. That isn’t to say that traditional marketing will disappear, but there will continue to be a shift to online media, whether through a PC or laptop or mobile phone, with the features and rapid response functionality they demand. Traditional business models should start preparing for future marketing trends now. The early adopters will reap the rewards of the new consumers when they come of age throughout the next decade. Understanding the different behaviours, interests and preferences of this group can inform the strategies you adopt, regardless of whether you personally behave in this way. You may not be web savvy, but within five years, your business will need to be as savvy as the kids are now. We would like to take this opportunity to wish you all the best for 2010!